Do you enjoy throwing things? How about throwing around some cards in an all out brawl; dragons, martians, and even pirates try and come out victorious as the cards fly. Dexterity games are kind of an odd duck in the board gaming world if you ask me. They are fun a lot of the time because of the stark contrast from purely strategic worker placement or decision making games. Like with the excitement of playing shuffleboard or other such games, the skill of your hands guiding your game pieces to victory can be very enjoyable. Maximum Throwdown makes this dexterity game focused on your ability to throw or toss playing cards into the play area covering other player's cards while trying to keep your cards exposed for better special abilities and points. While there is some strategy in trying to place your cards in certain areas, the concept of the game is very simple. Cover your opponents cards while trying to not cover your own. If you are not a fan of dexterity games or if throwing cards doesn't sound like much fun, you may want to skip this one (and check out Thunderstone instead, because I'm pretty sure you will like that one - who wouldn't). I continue to be impressed with AEG's quality they put into their components (especially the boxes that the games come in - feel great, durable, and look really nice). The game comes with 6 different factions or decks that you can choose to play with (those who have played other AEG games like Smashup will notice the artwork to be very familiar). Each deck is made up of 15 cards with different symbols arranged on the cards. The decks vary slightly, although I don't feel any real big differences between them myself during game play. The cards are nice and the game includes reference cards (these can also be randomizer cards if you want the decks to be chosen at random) as well as 6 different starting locations that help set up the initial play area. 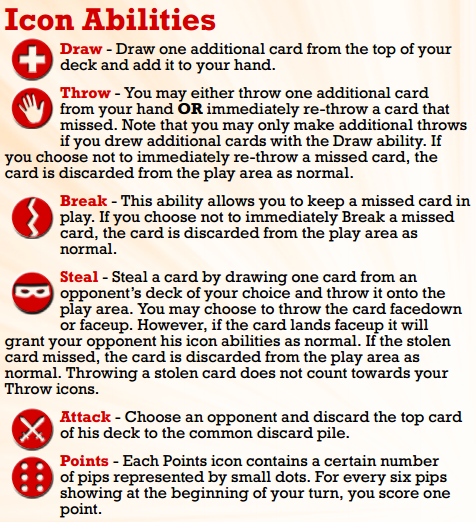 The rule page included is detailed enough for this simple little game. The hardest thing to get the hang of are the different symbols, but you have a nice reference card for that. I do wish they included some sort of way to keep track of score, but that isn't really a big problem either seeing that with the short game play usually groups could easily keep track of their own scores even without writing them down. you and the other players on how you want to start the game. The rule book suggests a few different formations of starting cards that you may want to try, but there are a plethora of ways to decide how to start the game. You can use the given designs, you can make your own designs, you can take turns throwing cards onto the playing area, or anything else that really floats your boat! Here are some crazy ideas for setups! You can set up different obstacles in the playing area (like I did with some Barrel of Monkeys) or you can even do some sort of multi-layered playing area. I really think that a big part in making the game fun is to customize your playing area to be as fun and different each time as possible. Creating challenges for card placement makes the game more enjoyable. You will also need to establish what the playing area will be and where you will restrict people to throw cards from. You can make the game more challenging by making the throwing distance much larger. You could even play by dropping cards down to a playing area from a loft or something like that. All up to you and your imagination. Shuffle your deck and you are ready to step into battle. Red and Yellow will score 1 point. Yellow is only 1 pip away from scoring another point! The goal of the game is to have the highest amount of victory points when the game ends. The game ends when all players have exhausted their entire deck and hand. The player who yells "Maximum Throwdown" the loudest goes first (although, I'm not sure that going first is really a benefit). On one's turn, the player evaluates what icons he/she has active (icons are completely uncovered). Then the player will score points, 1 point for every 6 pips showing, and either remember this number or add it to the scoring card or paper. Resolve any active Attack or Steal icons. Draw one card, plus any additional cards for your active draw icons. Throw one card, or more depending again on your active icons. Maximum Throwdown is an interesting game where dexterity is the only real role to victory. I don't feel that the game has a lot of strategy too it, but it remains a nice light card throwing game. Sometimes the game can feel very one sided if one player is dominating the play area with icons giving them even more icons; hence, it can be challenging to catch up with some players if not in the running early on. 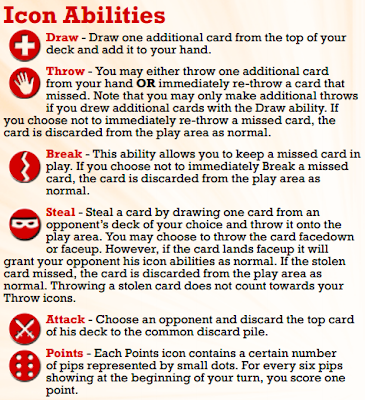 I like the concept of this little card throwing game, but I feel that setting up the game with obstacles or something different each time could definitely help keep the game fun and fresh. I give Maximum Throwdown 1 Finger Up or 6 out of 10 stars and that is just How Lou Sees It! A big SHOUT OUT to AEG for making this review possible!